There are so many things to learn when it comes to photography. Which is one of the reasons I love it so much. But trying to learn these concepts on your own can be quite the challenge. There are plenty of wonderful books out there to help you learn new techniques. From editing, to taking the picture, to even blogging, there are tons and tons of books out there. 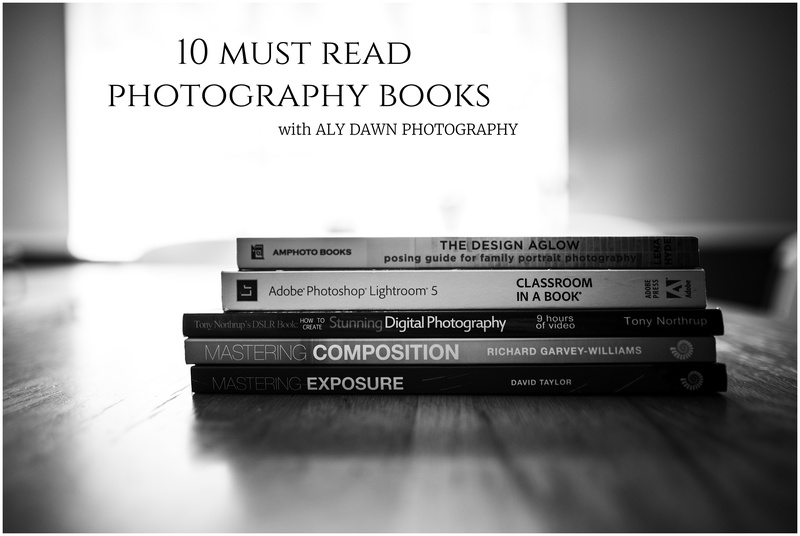 Here are my must read books regarding anything related to photography. need some help setting goals? check out my Settings Goals post. 1. Adobe Photoshop Lightroom 5: Classroom in a Book – I am very slowly making my way through this book. But just within the first 40 pages I have learned so much! If you are a newbie to Lightroom like I am, this book is definitely the one for you. I love how it has exercises that you can follow along with. It has a hands on approach and I love it. I’m excited to continue going through it and learning more about Lightroom. 2. Adobe Photoshop CC Classroom in a Book (2017 release) – I do not have this book, but I assume it’s similar to the one above. I have Creative Cloud (CC) and would most likely benefit from this book. If you need help with Creative Cloud and need a little more help than just with Lightroom, this is the book for you. 3. The Design Aglow Posing Guide for Family Portrait Photography: 100 Modern Ideas for Photographing Newborns, Babies, Children, and Families – This book has so many great ideas and tips to creating images. Not only are there tips on every page, but every photograph has the settings that were used and what type of light was used. Reading through the book is easy and fun. The pictures are beautiful and the tips are so helpful. A must read! 4. Mastering Exposure – This book takes you through the basics of exposure – ISO, shutter speed, and aperture. It breaks each one down and explains them better. Then after that it goes through and explains how to achieve certain effects with specific settings. It’s a great read and will definitely help you if feel like you are struggling with exposure. 5. Mastering Composition – Just like Mastering Exposure, this book will also take you through the basics of composition and then go more in depth on how to get certain comps. 6. Skin: The Complete Guide to Digitally Lighting, Photographing, and Retouching Faces and Bodies – I haven’t read this book but it is definitely on my list! I have heard great things about it. Skin in photographs is probably one of the hardest things to get correct. This book will help you do just that each and every time you edit your images! Going along with this book, another great guide is Flawless: The Secrets of Skin (Sarah Wilkerson) from Clickin Moms. 7. Photographic Composition: A Visual Guide – I’ve had my eye on this book for quite a while, but I need to finish a few books before buying any more! This book has beautiful photographs, with an in-depth breakdown of the photographs and why the composition works for it. Definitely buying this one next! 8. Capture the Moment: The Modern Photographer’s Guide to Finding Beauty in Everyday and Family Life – This book is next on my list of books to buy. Created by Clickin Moms, this book goes through natural light, composition, storytelling, fine art, black & white, low light, and the technical aspects of photography. Along with having beautiful images for each category, there are also creative exercises to try and perfect. This book is perfect for getting out of a rut and being inspired. 9. Mastering Macro Photography – This book comes out October 1, 2017 and I am beyond excited about it. It is similar to Mastering Exposure and Mastering Composition – made and written by the same company. This book is sure to have beautiful photographs along with ways to achieve certain macro effects. Looking at Amazon, it will also explain the best equipment to use to get macro photographs. I’m really excited to get this book, I know it will help my macro photography. 10. Mastering Landscape Photography – Landscape photography is something that I dream of becoming better at and this book will help me do just that. I love the images in this book and the beautiful ways David Taylor explains things. There are so many books out there. What photography (or editing, writing, blogging) books do you recommend? Post in the comments below! This is such a useful blog post Alyssa! Thanks so much for sharing, I’ve added a few of these to my reading list!